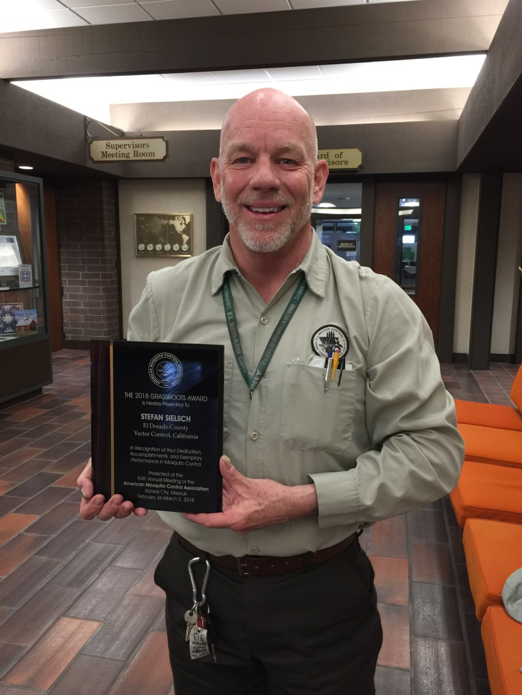 El Dorado County Environmental Management would like to recognize Stefan “Toogee” Sielsch for receiving the American Mosquito Control (AMCA) Boyd-Ariaz Grassroots Award for 2018. This award is given to recognize excellent performance and dedication by mosquito control field staff. Toogee is starting his 7th season with El Dorado County Vector Control and is a Vector Technician II who also acts as the lead tech in our South Lake Tahoe office. He holds a CA Dept of Public Health Pesticide Applicator Gold Card with licensing in all four categories A,B,C, and D since 2013. Toogee is also a member of the AMCA. Volunteering outside of work Toogee is very active with three different wildlife groups and is considered one of the best black bear aversion specialists in the Lake Tahoe basin. Toogee was nominated for the award for being a natural leader who always goes above and beyond to not only do his job, but to excel at it and to continue learning as new science and information emerging in the Vector Control industry comes to his attention. Working in the Lake Tahoe basin environment, one of the most environmentally sensitive and protected places on the planet, Toogee is always looking for the most effective ways to mitigate vector borne disease issues with the least amount of environmental impact by emphasizing an Integrated Vector Management approach. Being a small Vector Control agency, he wears many hats on a daily basis. Not only is he highly adept at mosquito larval and adult surveillance, he is also tasked with identifying the species in our lab, then taking necessary steps of treating sources in the field. During the latter part of our season, Toogee is the go-to yellow jacket abatement specialist and treats hundreds of nests a year. Toogee oversees all submissions of rodent carcasses and West Nile Virus RNA swabs to be shipped off for testing. Lake Tahoe is a hot bed for Plague activity and Toogee has on numerous occasions worked closely with the CA Dept. of Public Health Vector-Borne Disease Section state biologists doing both live trapping Plague surveillance and treatment of areas for Plague activity. Toogee was also named as one of the co-authors of a presentation entitled “Plague in South Lake Tahoe” given by one of the state biologists at the annual Mosquito and Vector Control Association of California (MVCAC) meeting in 2016. Toogee is highly regarded by these state biologists and has been asked to assist in live trapping Plague surveillance in county’s other than El Dorado County on occasion. Toogee also oversees our public education/outreach program by manning the El Dorado County Vector Control booth at the local Earth Day celebration, the National Night Out event, and the Tahoe Farm Day event. He also speaks yearly to the South Lake Tahoe Emergency Management Community Council, and has spoken to the EMCC’s sister group in Placerville. Interested in being showcased in the Agency Spotlight? Click here to download the application! Past Agency Spotlights can be found here.